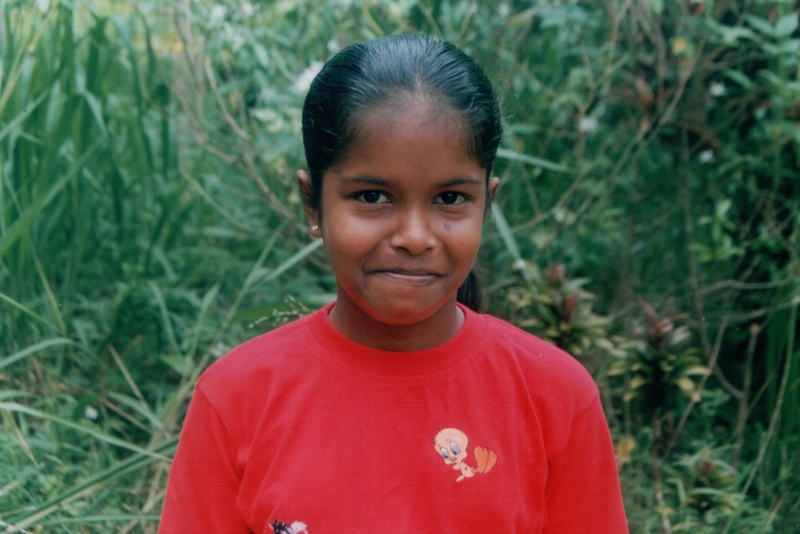 Dilini Nadeesha, my sponsor child in Sri Lanka. 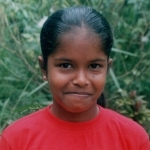 My sponsored child was born in 1991 and lives in Sri Lanka, in a village called Dombagahawela. Sri Lanka is a teardrop shaped island to the southeast of India. It is in a monsoon region, although the rainfall in Dilini's area is not sufficient for their needs. Most of the people are Buddhist, with some Hindu, Christian and Muslim. There has been civil war in the country since 1983, although there is currently a ceasefire. For more information on Sri Lanka see the Lonely Planet guide. In October 2002, two years after sponsoring my first child through Plan, I decided I could manage to sponsor a second child, and emailed Plan to let them know. 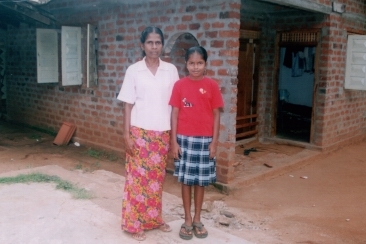 Within just a few days I received an introductory profile about my new sponsor child and her family. I also received two photographs of her - a girl with an impish grin, in a green field, and looking earnest outside a basic brick house, with her mother. It also arrived with a community profile of her area. I wrote a letter to them straight away, introducing myself, with a photograph. In November, I received my first Cross-Cultural Communication - about New Year in Sri Lanka. In April 2003, the first letter arrived. Many sponsor children cannot write, and a family member will dictate or write a letter, but Dilini had written herself. In fact there were two letters; one was written thanking me for sponsoring her, and a second was written in reply to mine. They were undated, but I would guess were written about two months previous. I wrote back at once, answering her questions and asking about life in her village. It looked like the start of a promising friendship. By August I had not had a reply. I know it takes a long time for letters to travel between our countries, particularly as in remote areas they have to wait for suitable conditions (no floods etc) and then deliver by bicycle or similar. I decided to send another letter in case Dilini needed more encouragement to write. In any case it will mean she received another letter sooner, rather than having to wait until I replied to her next one. In November I received both the annual update, with new photographs of her and her mother, looking much older than the previous year, and also received the annual Cross-Cultural Communication, about the Buddhist festival of Vesak. In December I wrote to both my sponsor children to explain our Christmas traditions and to say hello. Here is the letter I sent to Dilini. Just a few days later, in the last post before Christmas, two letters arrived from Sri Lanka! Dilini had written them on 10th October, so it had taken over two months for them to arrive. They were written in response to my two separate letters. The first letter told me about her family and village, the second about her progress at school. Then in February 2004 I received this letter telling me about her progress in school, her puberty ceremony and her love of music. In July 2004 I received this letter, dated 22 May, which tells me about the festivals they celebrate, in reply to my letter about our Christmas celebrations. It is definitely my turn to write now! 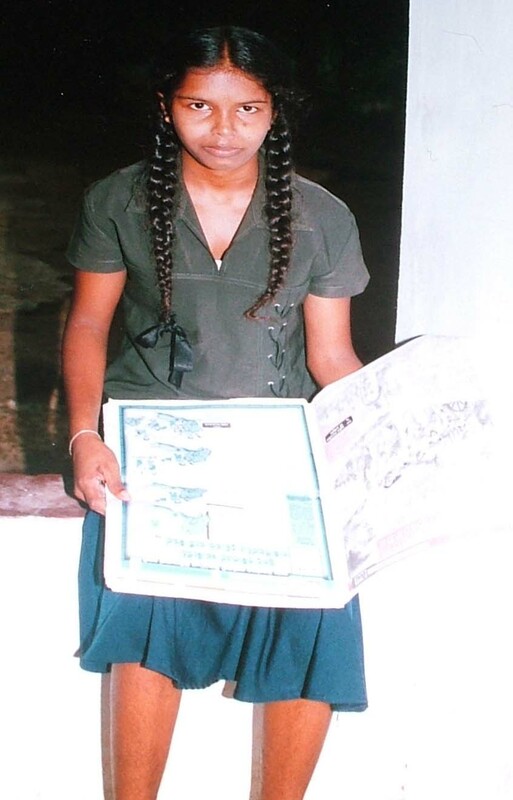 In September the annual update arrived, along with two new photos of Dilini, one with her sister Dammi, showing her reading a new children's newspaper which is provided by Plan. In October a letter from Plan arrived containing postcards showing the seasons, so I sent the Autumn one to Dilini and described the weather and how I had just bought a winter coat. On 26th December 2004 the tsunami struck Sri Lanka. Dilini lives just a few miles from the coast, so I wrote her a very concerned letter. I was also informed by Plan that my sponsor child had survived. On February 24th 2005 I received this letter from her, to my great relief. She told me how some of her family had died. She also enclosed a Happy New Year card in which she had written, in shaky English letters, "My Dear Flash Wilson, wishes for you until speak again, your friend Dilini" which was very touching. Dilini has repeatedly asked me to visit her one day, unfortunately I can't afford to travel to Sri Lanka to meet her at present, but I look forward to writing to her as she grows up. Maybe one day she will have her dream and we will meet. I'd love to hear from anyone who has been to Sri Lanka or who knows a cheaper way to get there.